The NH-U9DX i4 is based on the latest version of Noctua's award-winning NH-U9 coolers. First introduced in 2005, the NH-U series has become a standard choice for premium quality quiet CPU coolers and won more than 400 awards and recommendations from leading international hardware websites and magazines. Sporting four heatpipes, a surface area of more than 3800cm² and two premium grade 92mm fans, the NH-U9DX i4 provides a significant upgrade in quiet cooling performance compared to common 2U solutions. At the same time, its 125mm height makes it fully compatible with standard 4U cases. The award-winning NF-B9 92mm premium fan features Noctua's renowned SSO bearing as well as advanced aerodynamic optimisations such as Bevelled Blade Tips and Vortex-Control Notches. In order to achieve its superb quiet cooling capability, the NH-U9DX i4 comes equipped with two NF-B9 fans in a push/pull setup. 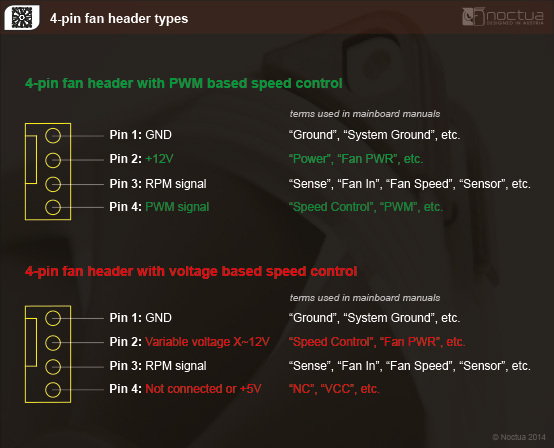 The NF-B9 92mm fans supplied with the NH-U9DX i4 support PWM for convenient automatic speed control through the motherboard. In addition, the maximum fan speed can be reduced from 1600 to 1300rpm using the supplied Low-Noise Adaptors for even quieter operation. Noctua's SecuFirm2™ mounting systems have become synonymous with quality, safety and ease of use. 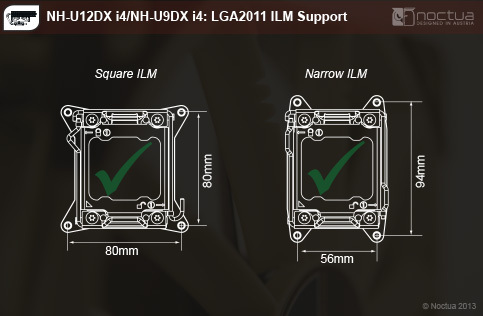 Supporting Intel's LGA2011 (both Square and Narrow ILM), LGA2066, LGA1356 and LGA1366 Xeon platforms, the SecuFirm2™ mounting included with the NH-U9DX i4 guarantees perfect contact pressure and maximum convenience on all sockets. Noctua products are renowned for their impeccable quality and outstanding longevity. Like all Noctua fans, the supplied NF-B9 models feature an MTTF rating of more than 150.000 hours and the entire NH-U9DX i4 package comes with a full 6-year manufacturer's warranty. It has been over ten years since I reviewed the original Noctua NH-U9 heatsink, and I’m happy to say that the new 92mm towers are even better. Both the NH-U9DX i4 and i4 U3 did an excellent job cooling a toasty Xeon E5-2670 and managed to do so at very reasonable noise levels. The mounting kit that comes with the heatsinks is excellent and I especially love the fan wire clip system they use now. Not only does Noctua support narrow ILM mounting on these heatsinks, but they also include two sets of brackets for different mounting orientations. The included accessories are generous, including a large tube of their NT-H1 thermal paste, and NA-RC7 low-noise adapters. With the NA-RC7 adapters, Noctua can keep the full-speed RPM a bit higher for maximum cooling performance but still provide buyers an easy way to reduce RPM and noise if needed. 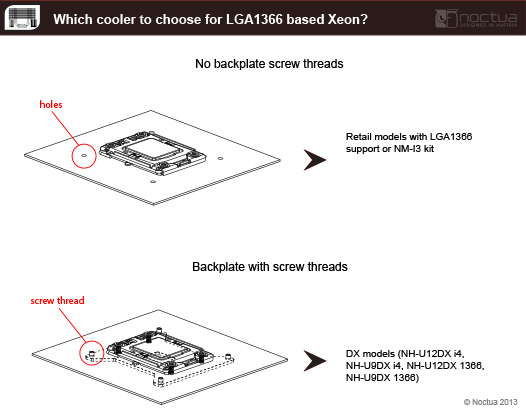 The original question I was hoping to answer in this comparison was whether to buy the NH-U9DX i4 or the i4 U3 heatsink for my three compute nodes. In my situation, the NH-U9DX i4 appears to be the better choice. It currently retails for slightly less than the i4 U3, includes two fans instead of one and has better RAM clearance. My mid-tower cases don’t need the shorter stance that the i4 U3 provides, but if height is important, the i4 U3 may be for you. Its no secret that Noctua heatsinks and fans come at a premium price, but I’d argue that you certainly get what you pay for. You don’t just pay for a brand name – the quality is very evident in all their products. Прежде чем мчаться в магазин за дорогостоящим и массивным Noctua NH-D15 для охлаждения Intel Core i7, повнимательнее присмотритесь к Noctua NH-U9DX i4. Почти наверняка для Socket LGA 2011 он окажется не худшим и даже выгодным вариантом. Pensando também no caso desta motherboard X99 usada com Narrow-ILM, é uma boa solução para substituir o cooler que a mesma traz de origem (o Dynatron R24), que é bastante ruidoso quando sobe acima de valores médios de velocidade, que com uma fan de 60mm chega às 7.000/7.500 RPM! Dynatron uses thick fans with heavy duty motors to produce high air pressure through narrowly spaced fins, yet even its powerful 80mm cooler can’t stand up to the cooling capacity of Noctua’s 92mm NH-U9DX i4. Dynatron’s fans also override motherboard fan settings, making it impossible to hold a moderate fan speed if the CPU is even a little warm. [...] Decibels are a logarithmic scale, so an increase of ten decibels has twice the sound pressure level. That means the R27 is nearly four times as noisy as the NH-U9DX i4, and the R24 is nearly twice as noisy as the R27. The Noctua heatsink was allowing the eight-core CPU to operate around eight degrees cooler than the Arctic Alpine 20 Plus heatsink fan that I was using previously on this system. This Noctua heatsink is also very quiet while offering great performance. Как видно из тестирования, Noctua NH-U9DX i4 продемонстрировал изумительные результаты при чрезвычайно низком уровне шума! Качество продукта, эффективность охлаждения, уровень шума  всё по высшему разряду. Как и цена. Но NH-U9DX i4 определённо стоит своих денег! Oggi vi mostreremo il nuovo prodotto di casa Noctua, azienda che non ha bisogno di essere presentata, nota a tutto il mondo per i propri prodotti affidabili e di fascia alta. Annunciati pochi mesi fa, l’azienda ha rilasciato un nuovo dissipatore che prende il nome di , Noctua NH-U9DX i4, prodotto destinato a raffreddare i bollenti spiriti delle soluzioni LGA2011/LGA1356 e LGA1366. Noctua NH-U9DX i4 performans olarak Corsair H110 sıvı soğutmalı soğutucunun biraz gerisinde kalırken abisi D14 kadar performans gösterdi.